We are among the well-known names in the industry for offering Excise Billing Software services. Our services are handled by knowledgeable experts who employ sophisticated technique to complete these services. Our services are highly praised in the market due to their low prices and timely completed. We are well known in the market for offering Excise Software services to all customers. This software is perfectly made by the use of perfect coding of different languages. Professionals of our team, work hard to offer excise software services to our commercial patrons to serve their all needs. I-DEx is a excise invoicing system for dealers.Must have for importers, distributors, traders or dealers registered with excise department.A compact, simple and easy to use solution having unique user interface. 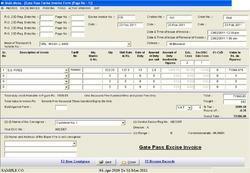 We provide Trader Excise Software & Manufacturing Excise Software . Our services are widely appreciated by the clients. Excise Software, the data has to be keyed in once and the records get updated . Central Excise, VAT and every requirement of ours is delivered. InventoryPlus Free Store Beer Shop POS Software help manage your shop retail business from the point of sale terminals to the accounting back office. One of the best in industry free Store software is simple and user friendly so any normal user can operate it. System simplifies the new staff training. Built in stock report as required excise department of India. integration of the same with your accounting system.